This article is part of the outcome of work commissioned and paid for by PIP charity and completed at UCLan in 2015. We thank Professor Kalaminder Singh for this summary and refer readers to the article on Acyl homoserine lactone on this page. 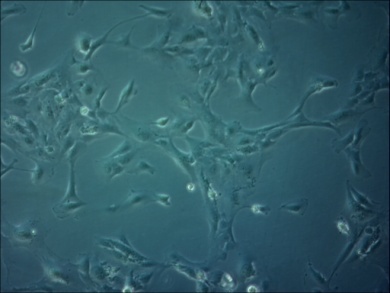 The cell lines used in the study were U87 MG and SVG P12. The palmitoyl ascorbate (PA) (BioXtra, Purity 99.0%), Sodium taurocholate hydrate (powder form, 86339, Purity 97.0%), cis-Diammineplatinum(II) dichloride (Crystalline form, P4394), Diphenyleneiodonium chloride (D2926, Purity 98.0%) and 0.1mM H2O2 were purchased from Sigma-Aldrich, UK. The ROS assay was performed using a ROS Kit (Orange, MAK144) purchased from Sigma-Aldrich, UK. The PrestoBlue cell viability reagent used in the study was purchased from life technologies, UK. All cell culture essentials including Eagle’s minimal essential medium (EMEM), sodium pyruvate, L-glutamine, foetal calf serum (FCS), non-essential amino acids, trypsin and PBS were purchased from Lonza, UK. Other cell culture consumables such as 75cm2 and 25cm2 filter cap angled neck tissue culture flasks, pipettes, tips and 96-well plates were purchased from Fisher, UK. In procedure, 5mg of PA was taken in a clear glass test tube and 5mL of diluted ethanol was gradually added (10µL each time) to the test tube while shaking gently and then vortexed. Alternatively, 5mg of PA was dissolved in absolute ethanol (same as described procedure) by shaking gently and then the solution was diluted to make it up to 0.1% and 0.5% ethanol both in water and media. The solubility of PA was determined in NaTC solution. Firstly, 200mM NaTC stock solution was prepared by dissolving 107.6mg of NaTC hydrate powder (MW = 538) in 1mL of both distilled water and EMEM. The same previous procedure was followed to dissolve PA (by adding 10µL each time into 5mg of PA) in the NaTC solution shaking gently. 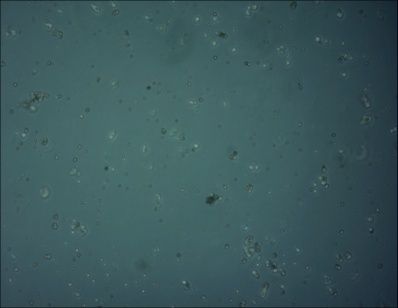 The cells (both SVG-P12 and U87 MG) were cultured in 75 cm2 filter cap angled neck tissue culture flask using Eagle’s minimal essential medium (EMEM) supplemented by L-glutamine (2mM), foetal calf serum (10%), non-essential amino acids 1% and 1mM sodium pyruvate and the flasks were incubated at 370C and 5% CO2 conditions. Further, cells were split every time when flasks became 70% confluent approximately. Both U87 MG and SVG-P12 cells were seeded at 5 x 103 cells per well per 100µL in sterile 96-well microtiter plates and incubated for 24h at 370C and 5% CO2 conditions. Then the media was removed gently and 90µL of appropriate test solution was added. For NaTC cytotoxicity, range of solutions of NaTC (0.2mM to 200mM) were prepared with EMEM by serial dilution method and added to the wells. Similarly, for PA cytotoxicity assay, series of dilutions of PA (50µM to 500µM) were prepared by dissolving it in respective molar ratio of NaTC solution ( PA: NaTC = 1:4) and added to the 96-well plate. The plates were then incubated for 48h (both NaTC and PA cytotoxicity) before addition of 10µL of PrestoBlue reagent to each well. For the time course, cells were treated with 400µM PA dissolved in 1.6mM of NaTC solution (Molar ratio 1:4) for 30 min, 2h, 6h, 24h and 48h before addition the PrestoBlue reagent. The plates were further incubated for 4h and then the bottom-read fluorescence was measured using a microtiter ELISA plate reader at an excitation and emission wave length of 535 nm (25 nm band width) and 615 nm (10nm band width) respectively. Cell viability was expressed as a percentage of the viability of untreated control cells. 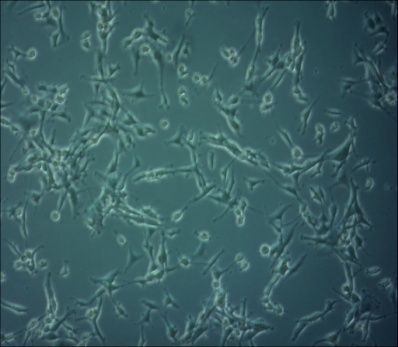 As a positive control, cells were treated with 50µM cisplatin for all viability assays. Furthermore, 2.5 x 105 cells (5mL, 5 x 104 cells per mL) were seeded in sterile T25 filter cap angled neck tissue culture flask and incubated for 24h at 370C and 5% CO2 conditions. Then the media was removed and 5mL of 400µM PA (dissolved in 1.6mM NaTC solution in media) was added. The flasks were incubated for 6h and 24h, then seen and imaged (10X lens) under an inverted microscope. 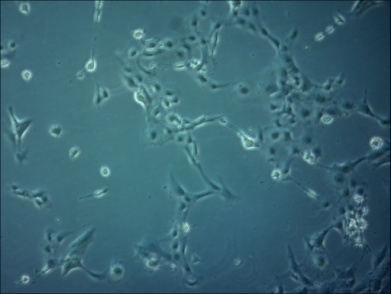 NaTC showed no apparent cytotoxicity at low concentrations (0.2mM – 2 mM against both SVG-P12 and U87 MG cell lines. 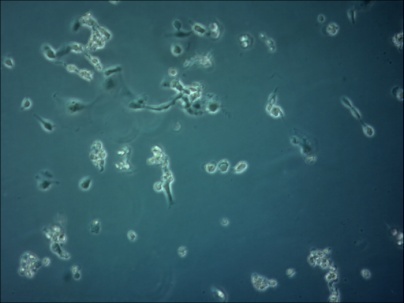 However, at 10 mM and higher concentrations, NaTC was found to cause significant cytotoxicity to both the cell lines tested. Based on these results NaTC at 2 mM or lower concentrations were chosen as a solubilising agent for PA for subsequent studies. 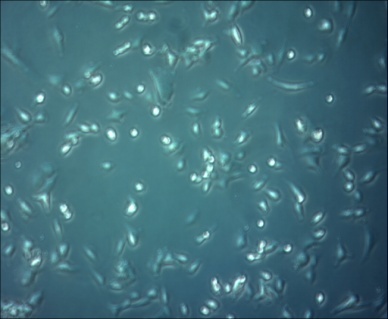 Fig 3:The images taken by an inverted microscope of the cells cultured in a T25 flask and treated with 400µM PA dissolved in 1.6mM NaTC (Ratio 1:4). (I) Untreated SVG-P12 cells, (II) SVG-P12 cells treated for 6h, (III) SVG-P12 cells treated for 24 h. (IV) Untreated U87-MG cells, (V) U87-MG treated for 6h, (VI) U87-MG treated for 24h. This study shows that PA exhibits potential cytotoxicity at concentration of 200 µM and above when tested in vitro on U87 MG cells. 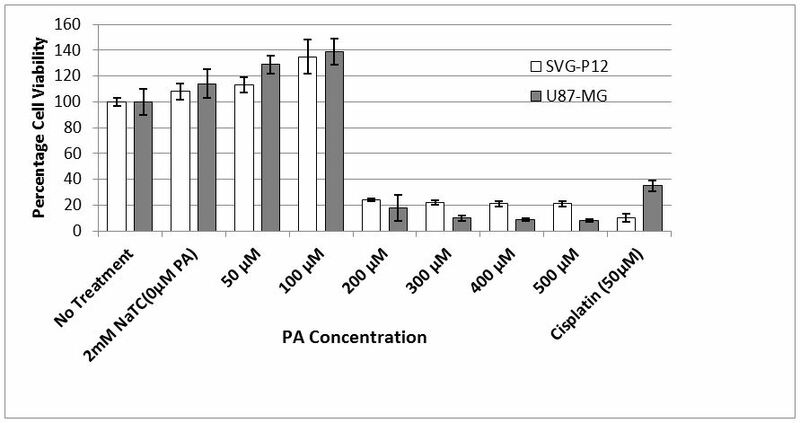 In addition, PA exhibited higher cytotoxicity towards U87 MG than SVG-P12 at higher concentrations. The study shows some promising results of PA reducing cell viability of U87 MG concentrations above 200 µM and warrants further investigations. Lipid microparticles could probably be further investigated as carrier for the food grade chemical mixture supplied by PIP. Suitability of various other lipids and/or surfactants need to be explored to arrive at the appropriate formulation with better particle size and flow properties. A suitable analytical method needs to be developed for quantitation of ascorbyl palmitate in the food grade chemical mixture to determine its content and carry out dissolution studies. Palmitoyl ascorbate has shown cytotoxicity towards human glioblastoma cell line (U87 MG). In addition, it would be of interest to determine its mechanism of action. Further work on determination of cytoxicity on other cancer cell lines may also be of interest. The aim of this study was to develop an improved Microvascular decompression (MVD) surgery using nest-shaped Teflon fibers. Eighteen consecutive trigeminal neuralgia (TN) patients who underwent MVD using nest-shaped Teflon fibers between January 2012 and December 2013 were included in this investigation. During the surgery, the nest shape of Teflon was formed by gently pushing Teflon prosthesis at the center position toward the periphery. Immediate postoperative outcome was evaluated using numerical rating scale (NRS) score, then patients were followed up for recurrence. Pain was completely relieved in 16 (88.9%) cases immediately after the surgery, and 2 cases (11.1%) achieved partial pain relief. Seven (38.9%) patients developed postoperative complications. All complications were successfully mitigated before discharge. The patients were followed up for 2.0 to 3.4 years. During follow-up, recurrence was observed in 2 patient (11.1%). No Teflon adhesion or Teflon-induced granuloma was found. The nest-shaped Teflon fibers in MVD surgery for TN is safe and applicable. The long-term outcomes and the comparison between hollow nest-shaped implants and the standard cigar-shaped implants should be assessed in the future investigation with a large sample size. After much trial we have reformulated PIPmix – the PD tonic so it should be more effective in more cases. This is taken as one dose of 10 ml (a dessertspoonful) or twice daily as 5ml (a teaspoonful). Some users find the twice daily regime gives longer lasting results. For holiday use Palmitoyl ascorbate (aka. E-304 or ascorbyl palmitate) can be supplied in sachets of powder each 2.4gm – the daily intake of the main ingredient in PIPmix. This is acceptable at airports and is sufficient to maintain the PIPmix effect for the duration of the holiday. PIPmix is supplied free of charge to trial participants. E-304 (aka. Palmitoyl ascorbate or ascorbyl palmitate) is to be used in a clinical trial as a remedy for the intractable pain of Trigeminal Neuralgia (TN). Up to now it has shown itself to be a 100% success even in cases where there has been TN pain for 30 years or more. There are no other remedies anywhere near so successful and most have unpleasant side-effects. In due course savings to the NHS will be in the order of tens of millions of £ per year. Our thanks to them for permission to publish this work which complements our findings that adjustment of gut conditions can greatly improve brain dysfunction. Intestinal microbiota are critical for health with changes associated with diverse human diseases. Research suggests altered intestinal microbiota can profoundly affect brain function. However, whether altering brain function directly affects the microbiota is unknown. Since it is currently unclear how brain injury induces clinical complications such as infections or paralytic ileus, key contributors to prolonged hospitalization and death post-stroke, we tested in mice the hypothesis that brain damage induced changes in the intestinal microbiota. Experimental stroke altered the composition of caecal microbiota, with specific changes in Peptococcaceae and Prevotellaceace correlating with the extent of injury. These effects are mediated by noradrenaline release from the autonomic nervous system with altered caecal mucoprotein production and goblet cell numbers. Traumatic brain injury also caused changes in the gut microbiota, confirming brain injury effects gut microbiota. Changes in intestinal microbiota after brain injury may affect recovery and treatment of patients should appreciate such changes. Recent experience of the use of lemon fish oil and palmitoyl ascorbate in a case of rheumatoid arthritis of some ten years standing has suggested that this might be a novel and highly effective treatment for this difficult condition. Palmitoyl ascorbate has been in use as part of a treatment for Parkinson’s Disease for the past 8 years. It is used widely in the food industry as an anti-oxidant and we are using it at a very safe daily intake level. It has other names: Vitamin C palmitate; ascorbyl palmitate; E-304 – all the same thing. We suggest a daily intake of 1 – 2 grammes (a heaped teaspoonful) together with 5 ml of Lemon fish oil. Palmitoyl ascorbate is lipid-soluble whereas Vitamin C (ascorbic acid) is water soluble. This difference in solubility enables this compound to be more effective in some situations than natural Vitamin C. For example, in laboratory conditions it is 100 % lethal to Helicobacter pylori – a nasty stomach dwelling bug. The mechanism of action of Lemon fish oil and palmitoyl ascorbate in rheumatoid arthritis is not known although it seems likely to be some combination of antibacterial activity together with some damping down of chronic inflammation.